This has proved to be a banner year for tomatoes in our gardens. YAY! So I decided it was time to make a pot of AUTHENTIC, pure, simple and FRESH Italian Marinara Sauce . . . a recipe from the late Marcella Hazan (author of “Essentials of Italian Cooking” which has become somewhat of the contemporary bible of Italian cookbooks written in English). I’m feeling more and more like an Italian Nonna (grandmother, which I really am) who has been standing over the stove preparing numerous sauces to can and freeze for the winter and to give to our kids. Picture me doing this: adding, tasting, adjusting, stirring, simmering, tasting again and again until perfection is reached! As she states in her book, “this sauce is unsurpassed” due to it’s purity of having nearly nothing but fresh tomatoes in the sauce. It isn’t complicated so don’t be intimidated. Having the highest quality of ingredients, as fresh as possible, is imperative. The interesting ingredient in this sauce is BUTTER, which at first sounded a bit strange to me! And then I thought, “Well, why not? 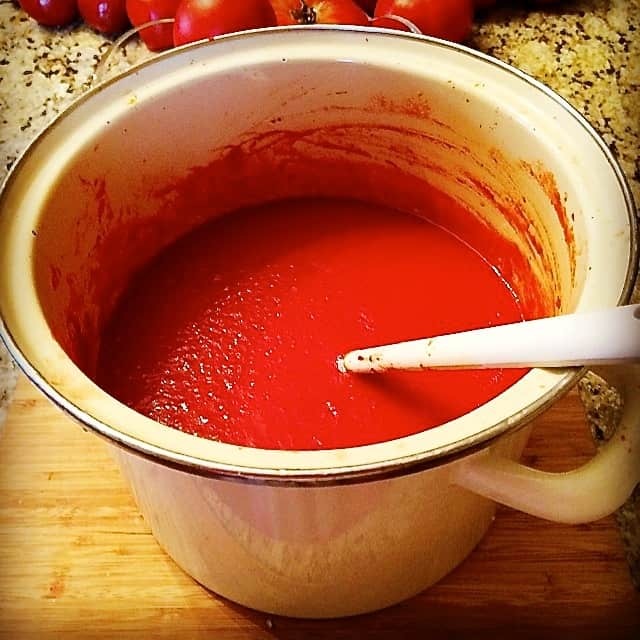 We add butter to tomato soup for added depth and flavor!”, so it must do the same thing for a Marinara sauce. Truthfully, I might even add more butter the next time I make this sauce! After the required 45 minute simmer that Ms. Hazan calls for, I found the sauce to be a little too thin and runny, almost like a tomato juice. I thought, “Man would this make one HELL of a Bloody Mary juice (with hot spices added of course)! Tuck that thought back in my brain for future reference! Again, if you make this, remember that it is pure simplicity with nothing else added. We also like lots of goodies in our Marinara sauce though! 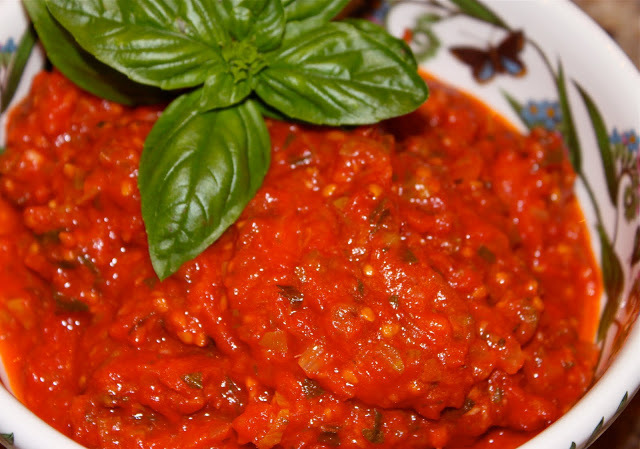 So here is the link to my Garden Fresh Marinara Sauce that has a traditional and delicious Italian “sofretto” base (sautéed onions, garlic, celery, carrots in olive oil) and basil. The secret to this and any good Marinara Sauce is FRESH TOMATOES! PERIOD! No commercial jarred tomato sauce can ever beat the fresh taste of home canned/jarred tomatoes from your gardens or farmers’ markets. Although time-consuming, this labor of love is totally worth it each and every time to make your recipes simply more DELICIOUS than ever!!! In a large pot, boil water on the stove on high heat. Fill a large pot of cold water and place right next to the pot of boiling water. Do not heat up this second pot of water. Place tomatoes in the hot boiling water to BLANCH until a crack appears in each tomato, this takes about 2 minutes. Immediately remove each tomato as they crack and place them in the pot of cold water to stop the cooking. When all tomatoes are in the cold water pot, take it to the sink and carefully drain the water which at this point will be warmed up from the hot tomatoes. Refill it with more cold water to stop the tomatoes from cooking. As the tomatoes are cooling, and safe to not burn your hands, begin to pull the skins off of each tomato and remove the stem. Using a hand-held tomato puree device OR a simple mesh strainer, mush the tomatoes through to remove the seeds. As you are doing this, remove the chunky pieces of tomato pulp and place in the bowl of strained juice, otherwise all you’re going to have is juice. Take an immersion blender (what I call a ‘boat motor’) and puree all of the pulp in the seedless juices. In a tall pot on low-medium heat, melt one stick of butter. Add the peeled, cut-in-half onion. Simmer on the stove with a pizza pan underneath to prevent burning, for 45 minutes. Add the tomato paste (this is my addition to Marcella Hazan’s recipe that we felt was too runny). Simmer for another 15 minutes to thicken. RECOMMENDATION: As Marcella Hazan states in her classic Italian cookbook, this is Marinara at it’s very purist and she’s right. However, we like the addition of “sofretto” (onions, celery, garlic, and possibly carrots) and fresh basil. I have a recipe for that as well on my blog “La Bella Vita Cucina” and it is delightful! Here’s another SUPER garden fresh tomato cold Gazpacho soup for you to enjoy! and help you enjoy the freshness of summer all year-long! Lucky you! I will have to buy some more tomatoes next week, so I can make some sauce too. It’s very rewarding and more healthy for us to have homemade sauces and foods. Angie, you already are a master at preparing recipes that are healthier! Con il pomodoro fresco dell’orto viene tutta un’altra cosa!!!!!! Buonissima.. baci e buona domenica! This probably sounds fickle of me, but it was definitely the AUTHENTIC label that got me excited here! What a wonderful, fresh sauce. Love it!! 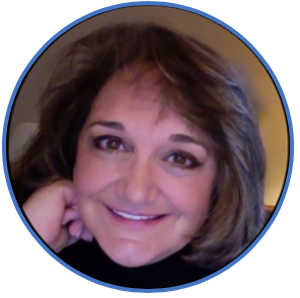 This sounds really amazing Roz! I have made marinara before, but not with fresh tomatoes. I bet it makes a big difference in how fresh it tastes. It’s so great that you had enough tomatoes in your garden to make salsa and marinara. So interesting about the butter. I can see that it would probably take it to a whole other level. Yum! I want to try your other marinara sauce, too, Roz. I don’t know why but I’ve been craving pasta and fresh tomato sauce lately! This sounds delicious and I’m glad you shared your experience and tips. What yield do I get from the garden fresh Marinara sauce? Hi Jayne, this produced a yield of approximately 3 quarts. Just to let you know that since preparing this ‘good’ recipe, that is very PURE in it’s entirety . . . there is a much better recipe that I have since found in “The Splendid Table” that involves sautéing a ‘sofrito’ of onions, celery, carrots, and garlic prior to adding anything else. But than again it is a recipe that is not as ‘pure’ as this recipe from Marcella Hazan. My family prefers marinara sauces a little more jazzed up with extra flavor, so that is what I add now before anything else. Please let me know if I can help you in any way!! !